I had this fun idea when I was eight months pregnant with Sophia, to share what I’m reading, but didn’t quite follow through. 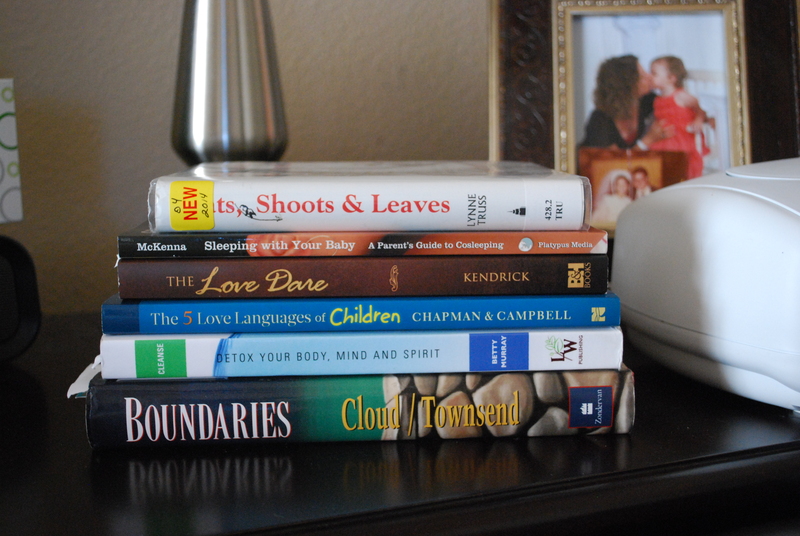 Well, now I’m finally getting around to doing this post since I have a lot of good reads cluttering my nightstand. If you know me, you’d know that I’m kind of a book nerd. Like a lot. Remember the scene in Beauty and the Beast when Belle finds out that Beast has a library, goes upstairs to said library, walks through the door, and is immediately in her happy place? Yeah, that’s totally me. 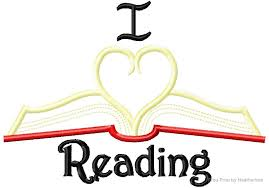 I admit it, I love books and reading! I could get lost for hours. Growing up I can fondly remember going to a book store, called Book Stop, and spending hours perusing the shelves and reading Garfield comics. Now that I think about it, my love of books led me to work at the Texas A&M Bookstore, in College Station, where I met my future hubby (Josh), and pursue a minor in English. Can you imagine a book nerd working around/organizing books AND having to read them for class? That’s pure heaven in my book. 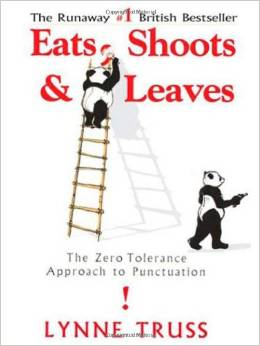 This led me to share with you what I am currently reading. These days you can find me in the midst of several books, since what I feel like reading depends on my mood or attention span. My intent is to maybe spark your interest and find a good read that you may have not heard about yet. I found this at the library, and having an English minor and a blog, I thought this was fitting and actually fun to read. I’ve been cosleeping with Sophia since she was born and wanted to get more research regarding my choice. Sleeping With Your Baby: A Parent’s Guide is your guide to understanding how to make nighttimes with your baby safe, fun and relaxing! 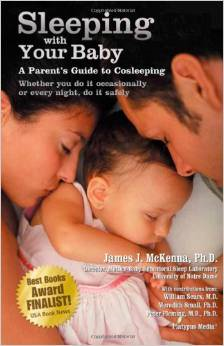 Written by James McKenna, the world’s authority on co-sleeping. A dear friend (and fellow book nerd) gave this to me over a year ago, and I finally decided to take the plunge to strengthen my marriage. Thanks, Jelly Bean! 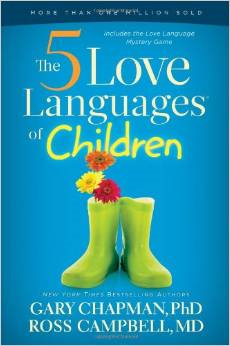 This is a MUST READ by all parents/grandparents/anyone who comes into contact with children (there is now a teenager version as well!). 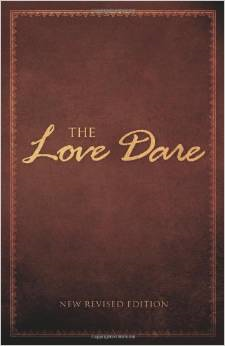 The original The 5 Love Languages should also be read, especially if you’re in a relationship. I can’t praise these books enough! This book is written by my nutritionist and has fabulous info about our bodies, our health, and the food we eat. Betty Murray, CN, HHC, RYT offers a comprehensive, scientifically based approach to achieving lasting wellness and weight loss. Steeped in years of research, The Cleanse program is designed to rid the body of a multitude of harmful toxins that pollute the body’s systems and organs and prevent the loss of unwanted pounds. With a knack for making the science of nutrition easy to understand and implement, Murray provides an in-depth understanding of the inner workings of the body and empowers the individual to make knowledge-based dietary decisions. Utilizing whole foods with optional supplementation, Murray gives the reader an easy, step-by-step guide to detoxing the body, mind, spirit, home and even relationships. Cleanse explains exactly what to eat and why and provides sample meal plans with an extensive collection of easy to prepare recipes. Watch unwanted pounds melt away, nagging health problems disappear and a happy, healthier new you emerge. This is another one that every.single.person should read! Apparently they have all kinds of editions for kids, dating, teens, etc. Check them out if they pertain to you. – Can I set limits and still be a loving person? – What are legitimate boundaries? – What if someone is upset or hurt by my boundaries? – How do I answer someone who wants my time, love, energy, or money? 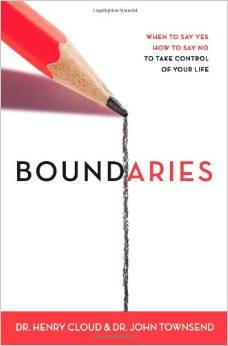 – Why do I feel guilty or afraid when I consider setting boundaries? So, that’s what I’m currently reading. How about you? What’s on your nightstand? 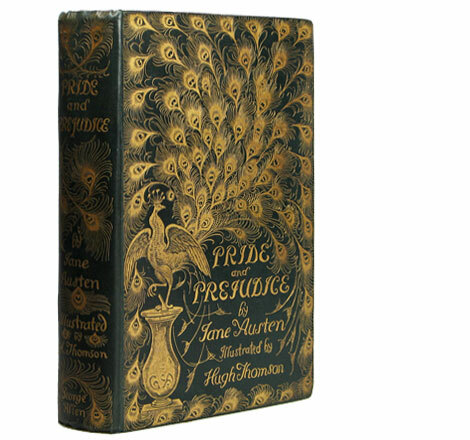 Do you have any interest in checking these books out? Let’s all share what we’re reading…I’m always on the hunt for a good book recommendation! Note: Links contain Affiliate Links. I have saved it foor later!